I am amazed at the love of God which He bestows upon those who serve Him. We have nothing but praise for our great God and the wonderful “teammates” of First Nation Ministries. Truly, God makes a way where there is no way. He tells us in His word, “Fear not for thou shall not be ashamed” Is. 54:4. WE SHALL NOT BE ASHAMED OF OUR FAITH for we know that without faith it is impossible to please Him. It is no discredit to be a simple believer. The faith which looks to Jesus alone is a crown of honor on anyone’s head. We go, the “wheels are rolling”; we give, and we get by simply seeking God’s will and doing it to the best of our ability. WE SHALL NOT BE ASHAMED OF OUR HOPE. It shall be even as the Lord has said; we shall be fed, led, blessed, and rested. God gives us a lively hope and then gives the things that are hoped for. WE SHALL NOT BE ASHAMED OF OUR LOVE. Jesus is altogether lovely and never, never, shall we have to blush because we have yielded our hearts to Him and love Him above all this old world has to offer. Yes, as we are told in I Cor. 13:13, “And now abideth these three; faith, hope, and love. But the greatest of these is love.” May our love for the Indian people increase more and more! Realize God means for you to be where you are. Be more concerned with God’s glory than your relief from the trial. Acknowledge your enemy, but keep your eyes on the Lord. Stay calm and confident. Give God time to work. He will take you through. Praise His name! How filled it would be with fears. The bitter and the fair. Would be more than we could bear. Just one little day to go. At 4:30 AM, Tuesday, April 27th, Bob King picked this old missionary up at his condo and we hurried on out to Troutdale to meet Les Phipps. Les fired up the wonderful “Big Rig” and we were on our way up the beautiful Columbia Gorge. At Othello, Washington, Agape Ministries unloaded the empty bins from the last trip and loaded us up with more potatoes. We praise God for teammates like Don Butcher and Earl Lee and their generous help to us. We then hurried on to get a good night’s rest as guests of Northwest Indian Bible School. 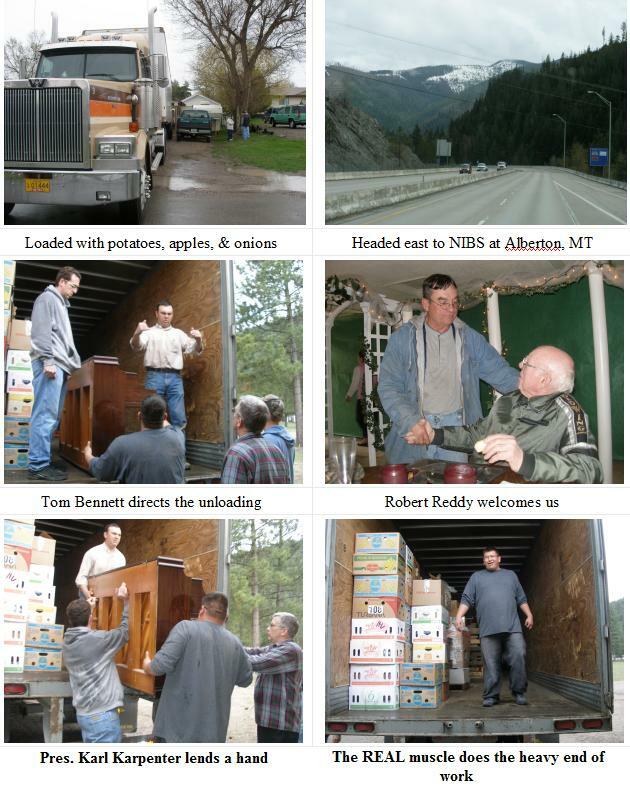 On Wednesday morning, April 28th, these good people unloaded what we had brought for them and we went on to our next stop at St. Ignatious, Montana. After spending Tuesday night in the guest house at Northwest Indian Bible School, we drove to St. Ignatius and met Bernie Lovell. Then, at our favorite café, we had a lovely breakfast and blessed time of fellowship. This little handmaiden of the Lord is always a great encouragement to our team. She has very limited means, but accomplishes so much it inspires us to praise God and press on! Her humble home and old storage shed would make the volume of food we bring impossible, but Bernie always finds a way. We had hoped to go on to Elmo, but the old preacher’s prostate problem and a catheter gone bad had us looking for help in the night. I have been in wrecks and thrown from horses; I’ve had broken ribs, legs, and cuts and bruises, but I always got help and the pain was gone. Out on the reservation my plugged catheter was the most painful night of my life until dear Bros. Les and Bob finally found St Luke Community Clinic and I got help. Our plans changed and we entrusted Bernie Lovell with the food for Elmo, Montana. The pictures from a prior trip give you an idea of our unfulfilled plans. We hurried home and I received help with eventual surgery on May 10th to remove a tumor from the bladder. Then on May 20th, I had surgery to remove a tumor from the prostate. Glad to report all is healed and none were malignant. I’m fine, praise God! Thank you for your prayers. Once again, dear Bro. Bob King picked up this old missionary at his condo and we met Jeff Phipps in Troutdale at 7:30 AM, May 13th. We are so grateful to the fine people at Coast Truck Center for their help with parking spaces. It handles all of our equipment: 2 big rig trailers, and the ‘99 Western Star as well as the Dodge Diesel and Wells Cargo van and a flat bed car hauler. 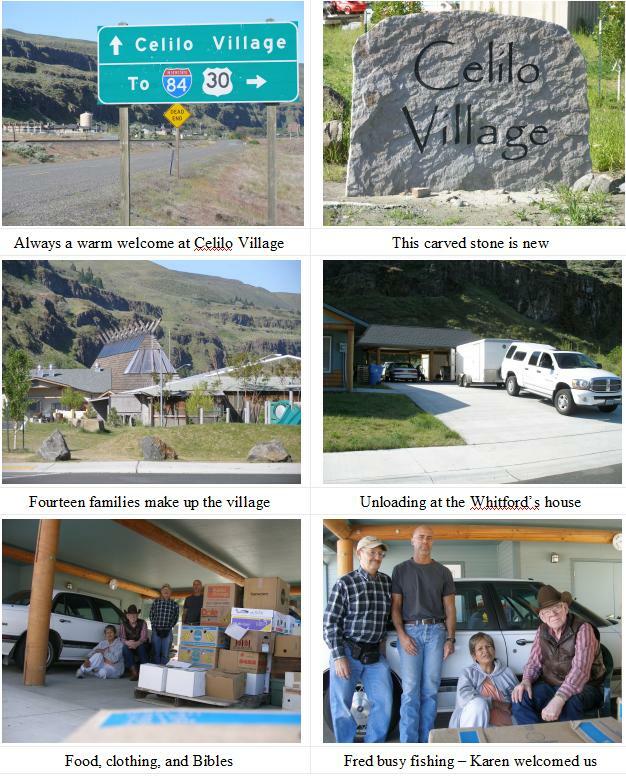 We arrived at the Celilo Indian Village at 9:00 AM. Bro. Fred Whitford was out on the Columbia River fishing for salmon with the other men of the village. This is a very important part of their lives and livelihood. Karen Whitford was watching for our arrival and was overflowing with gratitude to us and to God for sending us!